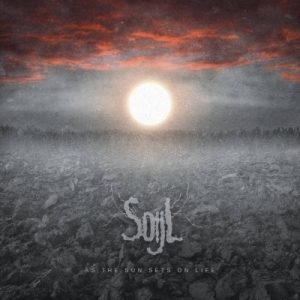 Soijl's sophomore offers more of the same majestic touches that made the debut so good. Beginning life as an informal solo project started around 2008 by multi-instrumentalist Mattias Svensson, already a veteran of several lesser-known Black/Death/Thrash bands, Soijl didn't become a serious venture, or an official band, until 2014. By then, Svensson had spent a couple of years with Saturnus, before teaming up with fellow ex-Nidrike bandmember Henrik Kindvall on vocals. Later, post-debut, Johan Mathisson, from Onda Makter, arrived as full-time drummer. On paper, that should make Soijl about 90% Black Metal, but Svensson is on record as having always wanted to play Doom, but never - Saturnus aside - having the opportunity or personnel to do so. So, the debut, 'Endless Elysian Fields', arrived in 2015, courtesy of Solitude, with a Death/Doom tag and to a fair quantity of critical praise. Sticking with the same line-up and label, sophomore follow-up 'As The Sun Sets On Life' will see official release tomorrow, in a rather stylish-looking limited digipak presentation. On the one hand, it should certainly please those who enjoyed the debut's combination of muscular and dynamic guitar-driven melodies and diverse vocals - it's actually quite hard to separate the two albums, even played back to back. Each one comprises seven tracks, mainly in the 7-9 minute bracket, running for around an hour, but unless you're keeping count, you probably won't notice the playlist click over to the new release. That, though, is less of a criticism than a reflection of how right Soijl got 'Endless Elysian Fields' - without radically changing compositional style, they didn't leave themselves much headroom for evolving and refining a different sound. Occupying the same sort of clear yet hefty soundstage, with the same distinct, precise mix and balance to the instrumentation, 'As The Sun Sets On Life' rumbles along exactly as you might anticipate: guitar lines merge and duel through riffs and expansive melodies, backed by solid unfussy percussion that can amp up the thunder when it needs to, allowing space for the expressive and varied vocals to sweep from spoken to clean to growl. Very occasionally, as on the closing of 'Death Do Us Part', extra features appear: ethereal female voice, in that instance, but there are other snatches of keyboards scattered throughout. It is, to be honest, a not unfamiliar path: in timbre, variety and range, both Henrik's voice and Mattias's guitar are reminiscent of Messrs Jacobsson and Ericson of compatriots Draconian, as are the morose and heavily narrative lyrics - though they all also have hints of a less symphonic When Nothing Remains. Less so, but nonetheless present, are moments nodding towards older My Dying Bride and, perhaps inevitably, Saturnus' 'Saturn In Ascension'. Where Soijl most markedly differ from those other bands is in the limited use of keys or any other instruments, and the slightly more Metal-oriented guitar interjections, including a fondness for squealing pinch harmonics: but, nonetheless, to me, it falls very solidly into the old-school Gothic/Doom camp, lacking only some of the more theatrical and orchestral flourishes found in some strands of that genre. Mood and atmosphere-wise, it certainly sits right alongside the aforementioned, and while not totally individual in approach, yet carries sufficient personality of its own. Perhaps more importantly, it can hold its head pretty high amongst such exalted company. It may not hold many surprises, but it doesn't really need to in order to resonate with the listener: working to a well-defined classic template is fine, in my book, if you have the compositional strength and musical firepower to do a proper job of it, and Soijl do exactly that. So, if you're a fan of that moody, mid-tempo, graveyard soul-searching sort of exposition, delivered with the typically slick melodiousness and polish of Gothenburg and beyond, here's another worthy example to add to your collection.